Bangkok is the unofficial sky bar capital in the world. There are countless venues to choose from which can be a problem if you stay in the city just for a few days. You can’t visit them all and might just be out for the one great shot of Thailand’s capital. Over the last 5 years, I have been to about 10 sky bars in Bangkok and in this post I’m going to present you my favorite one with the best views, where you are able to take the best possible picture of BKK’s infamous skyline. The sky bar I’m going to present you is called Vertigo & Moon Bar, located on the 61st floor of the Banyan Tree Hotel in the Sathorn district. To get there, take the MRT subway to Lumpini station and walk along Sathorn road (Thanon Sathorn) for about 200 meters and the huge hotel appears to your left. Just walk in, you don’t have to be a guest to get access to the sky bar on the 61st floor as well as to the restaurant on the 59th floor. Unless you are really hungry (and have a lot of cash to spend) don’t go to the restaurant but head straight to the very top of the building, the 61st floor, about 22 seconds by elevator – given no stops on the way up. If it’s raining, or has just stopped raining, the skybar will be closed due to safety issues so you will have to go for the restaurant instead. It’s still nice with the interiors like everything else luxurious and on 5 star standard, however you will have to take your picture from a glass window. As soon as you step out to the Vertigo & Moon bar on the 61st floor you are probably as overwhelmed as I was when I first came there. The impressive city skyline with Sukhumvit and Baiyoke Tower right in front of you and wherever you go – 360 degrees view all around, all open air with no windows disturbing the most spectacular view all over Bangkok. This is the moment to take some of your best photos of your whole Thailand trip. You may have a meal at the Vertigo Restaurant or a drink at the Moon Bar, both obviously not the cheapest choices in town (it’s 260++ Baht for a coconut or Singha beer), but definitely worth it. You can easily spend two or three hours on this rooftop just relaxing. Time seems to stand still here, compared to the busy city life down there. The set up of the Vertigo & Moon Bar is luxurious though cozy with tables and chairs draped in cloth and soft candle lighting all around. 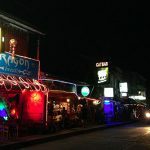 Even though it is a more and more popular place for tourists, you see a lot of Thais sharing a bottle of whiskey or expats “dropping by” for a cool beer after work. The Vertigo which is an al fresco restaurant, is open daily from 6:00pm to 11:00pm. The Moon Bar is the actual bar serving all kinds of non-alcoholic and alcoholic drinks including cocktails, wine and champagne, open daily from 5:00pm to 1:00am. Dress Code: Smart Casual. Just don’t show up with shorts and sandals and you will be fine. And even if you do – you can borrow pants and shoes free of charge at the entrance to the bar. I recommend coming at around 5:00pm and hang out for at least two hours, have a drink or two. Like that you can take your pic during daytime, sunset (BKK’s sunset are superb especially from November to January) and nighttime. Are you a fan of sky bars? What was your best rooftop experience here in Bangkok? Let me know in the comments.